The ceiling is probably the most neglected surface when decorating a space. We focus a lot on the floors and the walls but not so much on the ceiling which works out well most of the time but also makes us forget that there are a lot of great design ideas and strategies which we haven’t even thought of. Take a coffered ceiling for example. It’s the perfect design to make a high ceiling seem less dramatic and more homey. It’s also a great way to draw the eye up and to complement an otherwise simple interior decor. 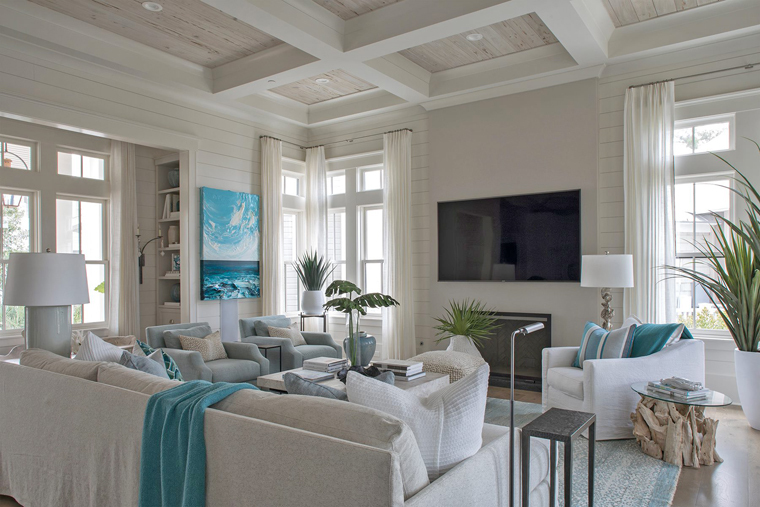 The coffered ceiling designed by Geoff Chick architects is a great fit for this breezy, coastal-themed living room. The light wood adds a lovely warm touch to the space and complements the neutral color palette just right. 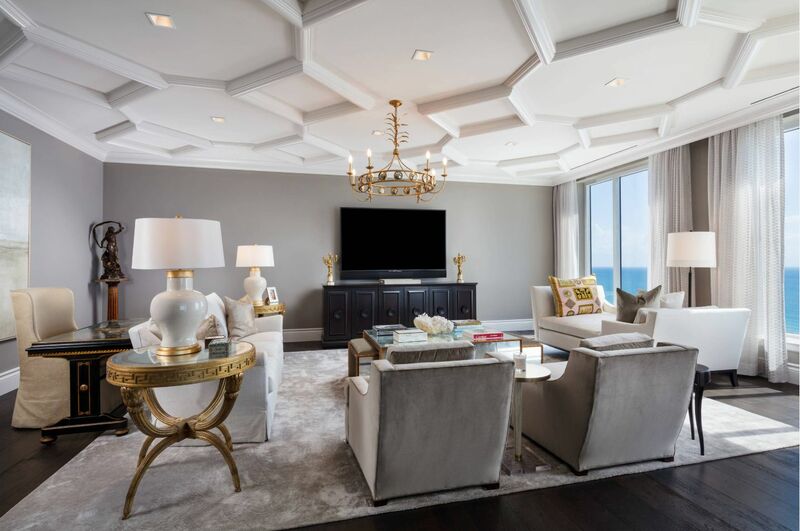 Coffered ceilings come in a surprising number of versions and styles. This design for example incorporates multiple geometric forms in a pattern that draws the eye up. It’s an interesting strategy for a living room which has dark wood flooring and gray and gold furniture. This is one of the projects completed by Willoughby Construction in Miami. There are very few limitations when it comes to coffered ceilings. They’re not just for living rooms and libraries but also for less ample spaces such as the kitchen. As it turns out, a coffered ceiling is pretty great for a kitchen because it lets you add multiple ceiling lights in a way that fits the decor. This eclectic kitchen was remodeled by My Design Studio. 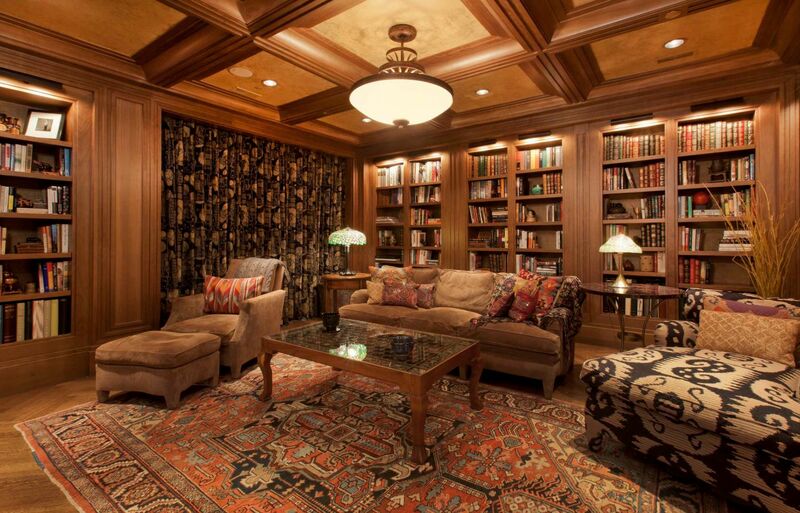 The most common space where you can expect to find a coffered ceiling is actually not the living room but the library. All-wood designs are very popular here. They give the space a formal, elegant but at the same time very welcoming and cozy look and feel. It’s the same thing for home offices like this one. Another traditional home office with a wooden coffered ceiling was designed by Frasier Martis Architects. It seems the whole room is wrapped in wood and this creates a particularly warm and comfortable ambiance. This is a pretty clever integration of a coffered ceiling into the airy, modern decor of a dining room. 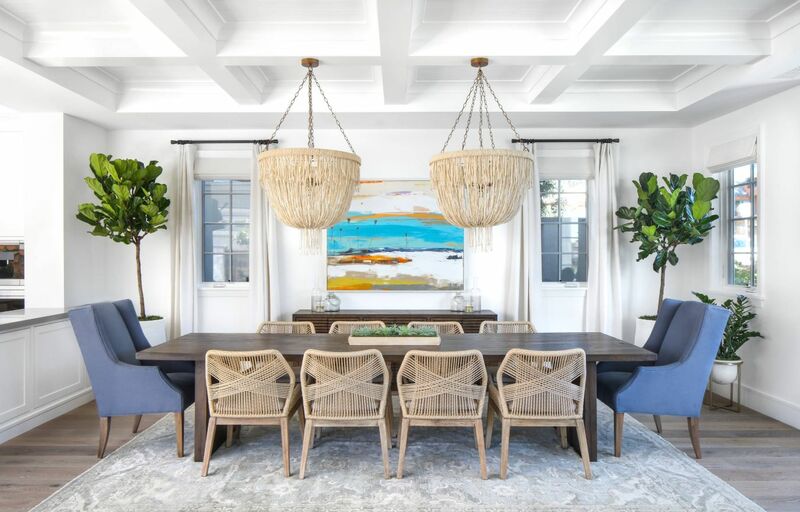 There are two chandeliers hanging from the underside of one of the beams and that places them lower than usual which works out great in the case of this beach-style setup by Lindye Galloway Interiors. 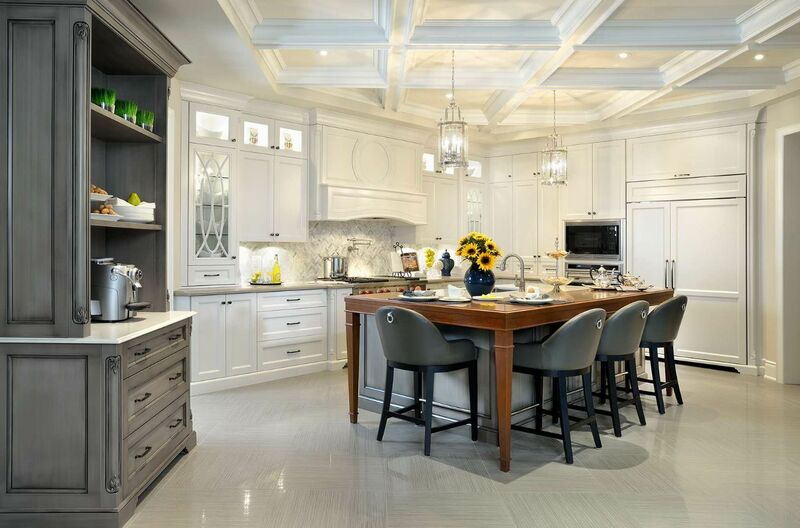 Another idea definitely worth considering is that you can use a coffered ceiling design to either differentiate various functions within an open floor plan or to visually connect them for a more cohesive and fluid appearance. 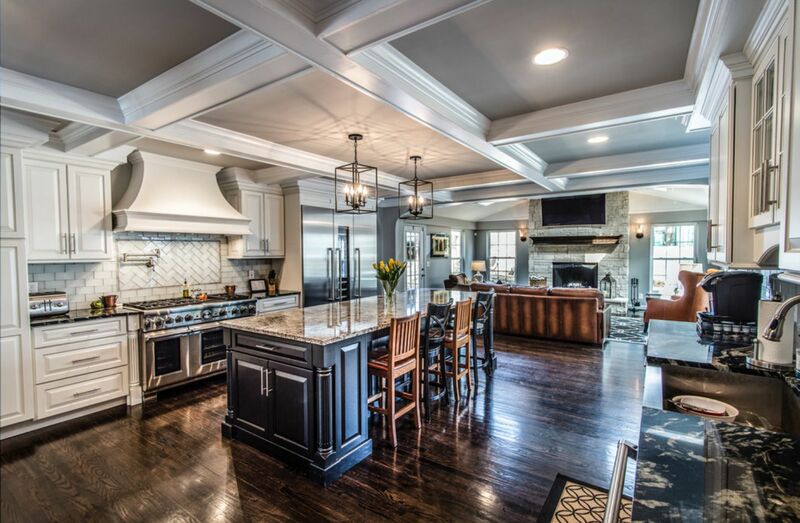 Check out this charming open kitchen done by GMT Home Designs for reference. There are a lot of ways in which coffered ceilings can be customized but sometimes it’s best if you just keep a simple design: a classic pattern, white on white, no crazy features. It’s enough to stand out and to make a room look extra welcoming. 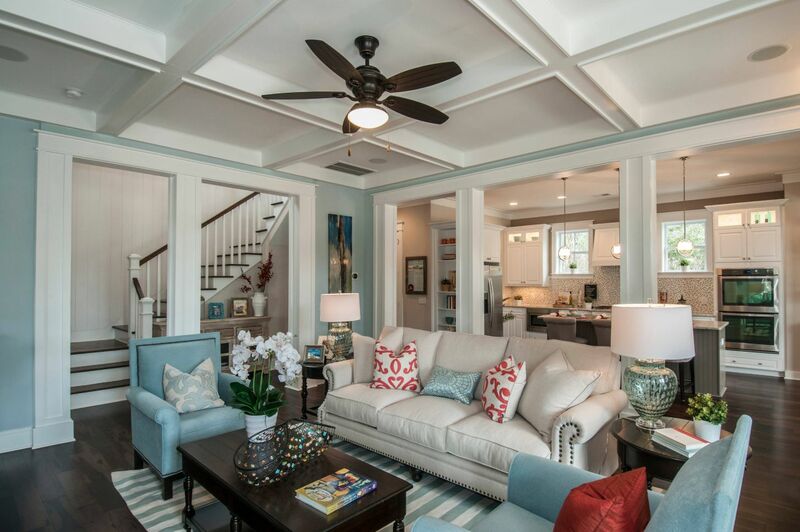 Speaking of ways to customize a coffered ceiling, color is a great resource. You can paint the gaps between the panels and they can match the walls. 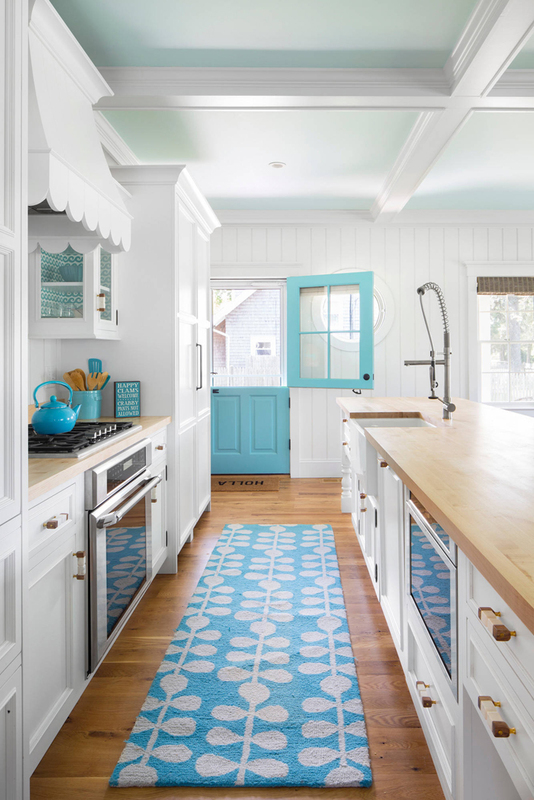 Another idea is to have matching floors and ceilings. This design right here was created by studio Advantes Group. A coffered ceiling can also be an ingenious way to deal with a room that has an unusual shape, like this home office which has been remodeled by Murphy & Co. Design. It’s a small room but it looks open thanks to the large windows and all the wood makes it look elegant and inviting and also gives it a professional allure. The post How To Successfully Integrate A Coffered Ceiling Into A Room’s Interior Design appeared first on Home Decorating Trends – Homedit.